I’ve spent a lot of time since Norton’s twelve month well visit worrying about toddler talking. Sometimes I was sure he was okay with the lack of toddler talking because he at least understands… but toddler communication is a bit difficult when it’s one sided. But we went to the language center and an interventionist evaluated him as “just fine” when he was assessed at thirteen months. We have an appointment with the same interventionist on Thursday. Norton will be nineteen months on Thursday. Out of desperation, I bought a book a few weeks ago, and I’ve been making my way through it. It’s called It Takes Two to Talk, and I’m starting to get some answers and understand a little bit better. I’ve often wondered what I’m doing wrong; I must be doing something since there’s no toddler talking going on. It turns out that I was right; I was doing something wrong. And maybe I have the tools to do it better. You see, Norton has always been a low maintenance child. He’s happiest playing by himself. It Takes Two to Talk calls that “Own Agenda Communication Style.” He tends to play on his own and rarely starts an interaction unless it’s because he wants something. Otherwise, he’s happiest on his own. There’s nothing wrong with that, of course. If anything, it just means that he’s more independent than most children his age, especially since he’s never been in a day care setting. The problem with that is on my end: he’s so darned happy to play with himself that he seems like he’d just rather not. Maybe it’s an introvert thing; both the husband and I are naturally introverted people. But because Norton is happy on his own and has little interest in someone else joining in, I don’t really know what to do to play with him. I find myself being “the watcher” who narrates what Norton is doing from the comfort of the couch. Quite frankly, I need to just get off the couch and join in. Maybe talk to him a bit so that he’ll talk back. And really, I never would have figured this out had it not been for reading It Takes Two to Talk. 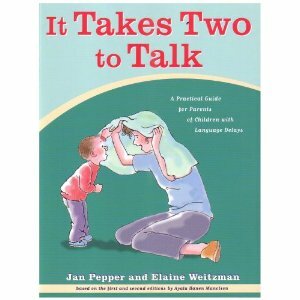 Hopefully between the visit with K and trying the things in the book, we’ll get some toddler talking going on. Did you deal with a toddler language delay? How did you get your toddler past it? Your son has a good vocabulary for his age and the pointing, throwing, etc. is normal. What I learned through years of speech therapy was DON’T let them point, throw, etc. MAKE him say what he’s wanting. If you “answer” when he points, he’s always gonna point. I labeled everything with 3×5 index cards. (Refrigerator, Stove, Bookshelf, Door, Window, Cup, Toy, Bear— you get the idea) What I found was, as soon as Nate did start talking… he could already read too. Killed two birds with one stone. On another comforting note… Einstein didn’t speak until he was four. Here’s hoping my boy is just a late talker who will discover his linguistic abilities soon. After all, it’d be pretty hard for him to rule the world if he doesn’t talk! I’m amazed by how wide the range can be with Autism. Good luck with helping your son overcome (or at least improve) his language issues! Oh my. I totally thought this post was about my own Son! Talks in his own language when he does speak. I keep telling my husband that our toddler should be saying more things and using words instead of pointing. He assures me he’s just being a boy! 🙂 I’m right here with you on this road, sister. My son is having a language delay as well. He’s almost 3 years old, and he says a few words, but mostly he speaks in his own little language. He’s a smart kid, and he proves that every day with the things he can do, but he refuses to use actual words. Thanks for suggesting that book. I’m going to pick it up later this week and see if there is anything I can do to speed up his talking. On the bright side, I have noticed that as my younger son is starting to learn to speak (he’s 10 months old) my older son is mimicking his little brother. I have a very good feeling that having a younger sibling to play with and communicate with might be the biggest help in overcoming this delay. It’s very relieving to see so many other people with children that have language delays as well. Keeps me sane sometimes. Thank you. Hopefully it helps you! Have you sought intervention yet? A good speech pathologist can also help him catch up. Best of luck to you!